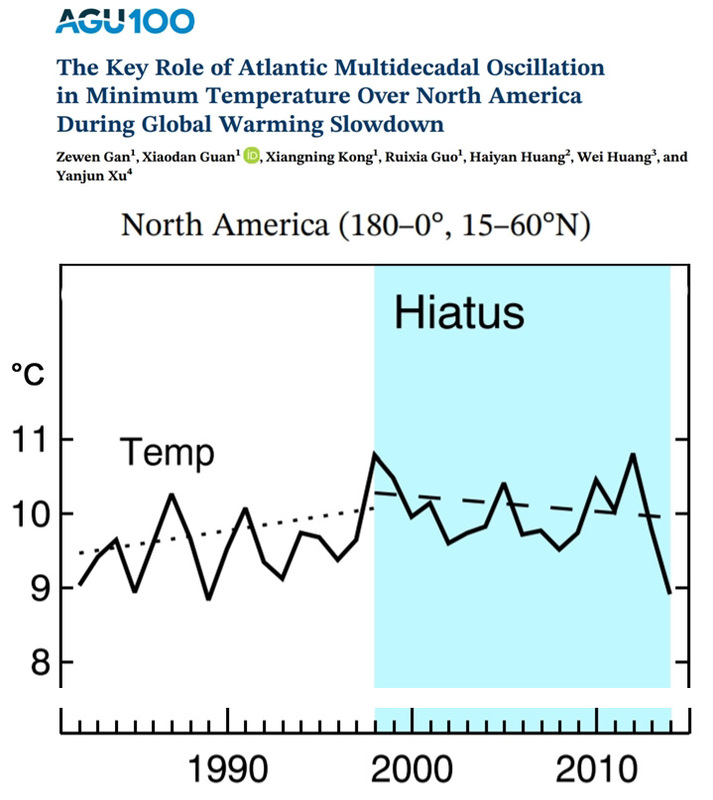 North America (180-0°N, 15-60°N) has been characterized as a “major cooling center” by the authors of a new paper (Gan et al., 2019) published in Earth and Space Science. The continent warmed from 1982-1998, but a cooling trend since 1998 has nearly wiped out all the previous warming. Overall, there has been no significant temperature change in North America since 1982. 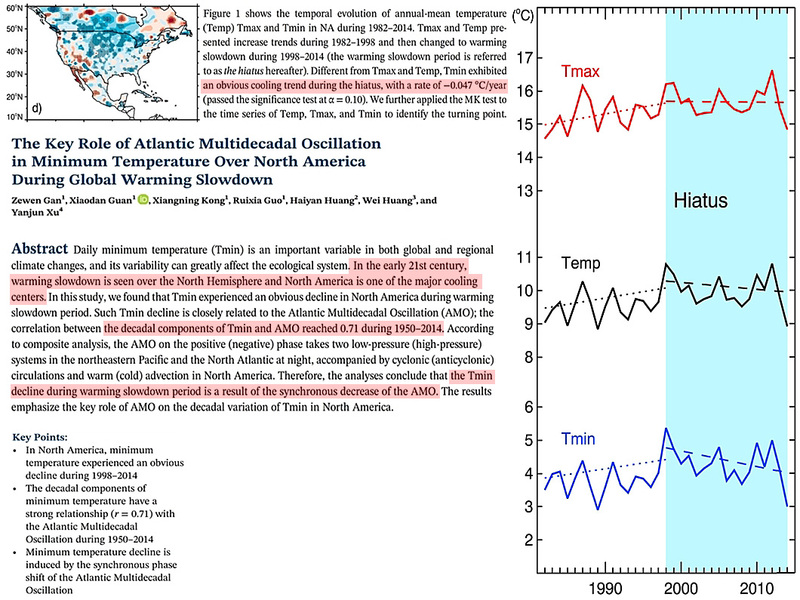 The warming and cooling trends, especially the daily temperature minimum (Tmin), are well-correlated (r=0.71) with the path of the Atlantic Multidecadal Oscillation (AMO) during 1950-2014, leading the authors to conclude that the temperature trends over this 32-year period are “a result of” natural changes in the AMO. 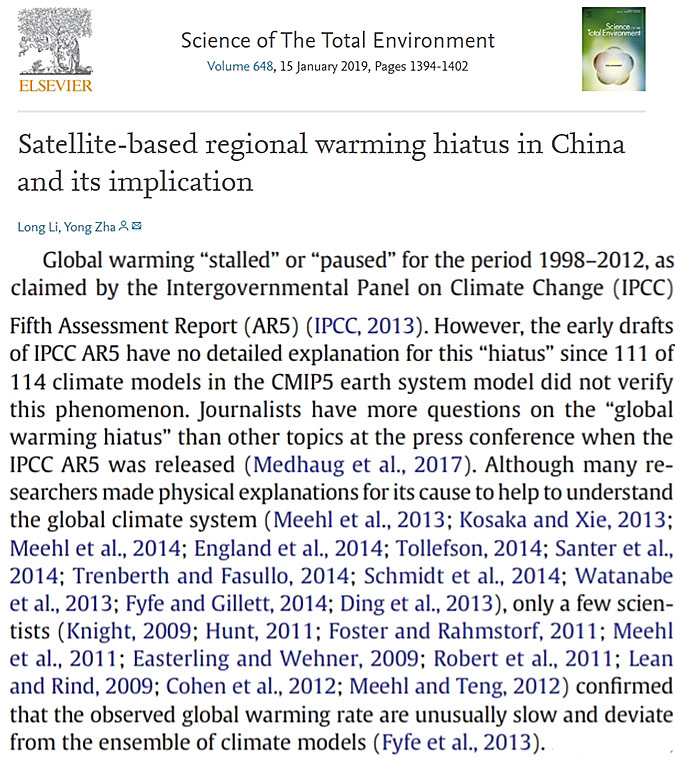 Another new paper renews the global warming “hiatus” debate and documents a 21st century cooling trend in northern China that also effectively snuffs out the previous decades of warming for the region. It is a shame that these two papers have not been reported by MSM. It might dampen the enthusiasm of the marching students worldwide – prompted, of course, by adult educators, politicians and parents. If natural variation can offset GHG warming one has to question whether GHG were the cause of the initial warming. Thanks for reporting these new papers. 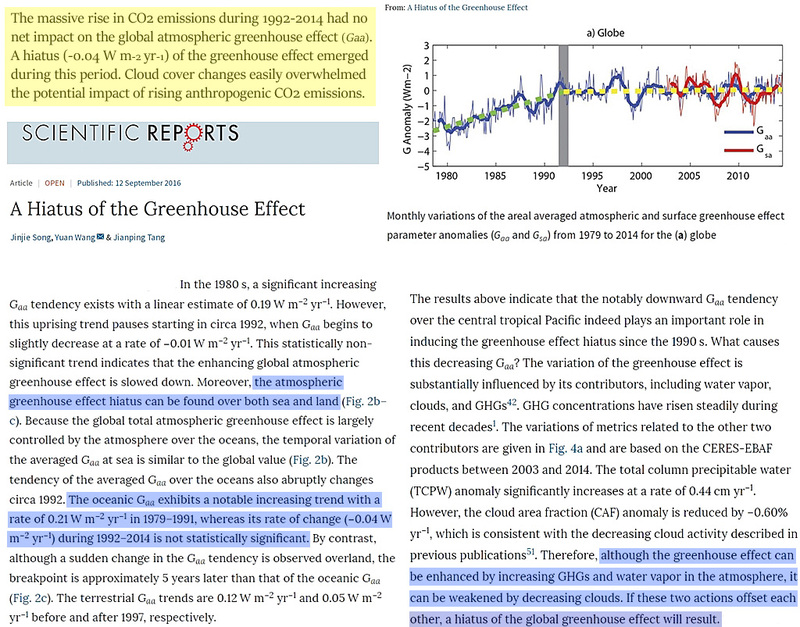 These papers aren’t contradicting AGW or anything about CO2 and other GHGs causing warming. If you are under that impression, then you should probably try to understand what you are arguing against. Of course natural variations can offset the GHE. Drop a bucket of ice into a boiling pot of water on your stove. The ice offsets the effect of the stove pretty well, but the heat content of the pot/ice system is still increasing due to the stove adding energy/heat to the system. Or maybe imagine what would happen when the Gulf Stream weakens. Europe wouldn’t have such a mild climate anymore … yet the heat still exists and will effect the climate in other regions. Internal variability doesn’t change the global effect of more greenhouse gases in the atmosphere. 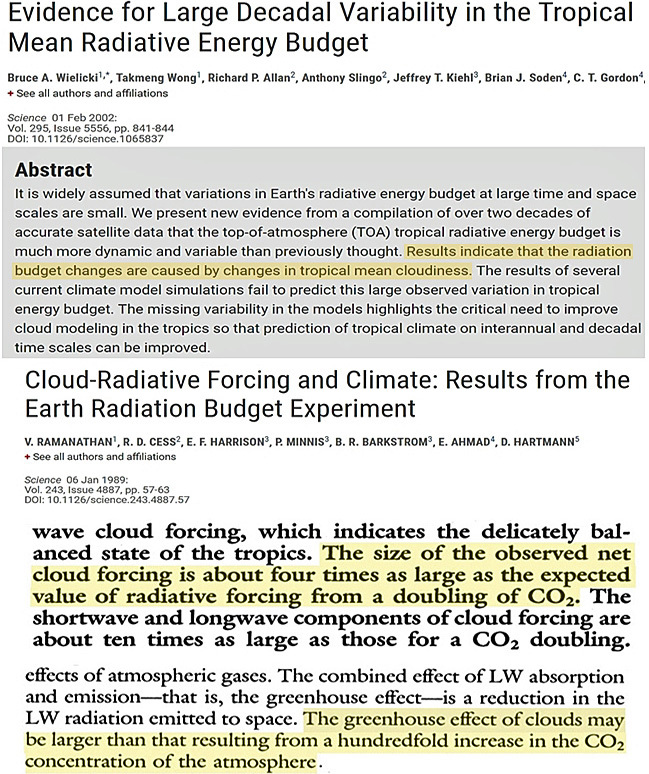 These papers aren’t contradicting AGW or anything about CO2 and other GHGs causing warming. There is nothing that contradicts anything about CO2 causing warming. That’s because it’s an unfalsifiable belief. When the data do not support it, it’s either dismissed or “adjusted” until it does. Of course natural variations can offset the GHE. 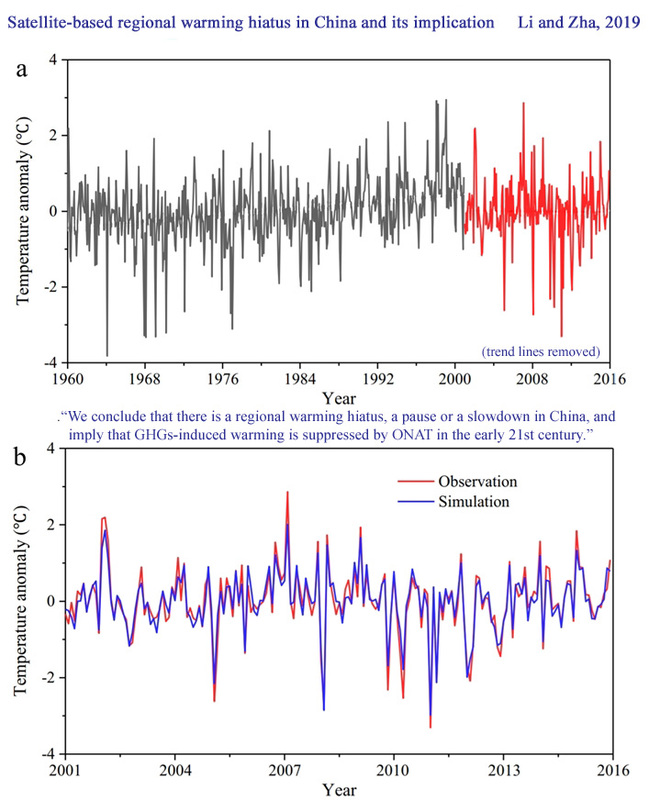 Just like during 1992-2014, when there was a hiatus in the GHE’s influence on temperature changes (-0.04 Wm-2/yr) due to the reduction in cloud cover. The effect of +45 ppm additional CO2 during that span was wiped out by a small change in clouds. So the GHE can be “offset” or cancelled out by changes in clouds, which are 10-100 times more influential than CO2 in affecting how much solar radiation is absorbed by the surface. And yet SebastianH believes that easily-wiped-out CO2 dominates climate forcing anyway. Anyway, there is nothing unfalsifiable about CO2 and its effect and it is far from being a belief. What you do looks like a religion to me though. P.S. : You did notice that both papers support the notion of greenhouse gases causing warming, right? North America, China, Europe, – it wouldn’t surprise me if most of the areas they still claim are warming are Arctic and Antarctica, places we don’t have thermometers so the temperatures are modeled. Remember a few years ago there was a big media circus about beetles that were destroying trees in North America. Apparently the winters weren’t cold enough so these critters were surviving winters in larger numbers. The predictable predictions flowed forth from the sagacious talking heads that this new global warming disaster would continue and increase with accelerating warming, and that America would be bald of any trees within x number of months etc. That story of course has gone quiet now. I think that the last few winters have been plenty cold enough to kill off both those beetles and that media adventure. The Khmer Vert are very agile at jumping from story to story. When one disaster scenario fails then deftly hop to another with the skill of a conjourer so that the non-alert audience would notice no pause in the disaster narrative. Hiatus or no hiatus may be the wrong issue. The more important feature since 1998 may be: Temperatures failed to trend downwards. They “should” have done so because the cooling phase of a routine, roughly 60-80 yr temperature cycle was scheduled to start around 2000-2010. The warming phase stretched from 1970 to 2000. Following is a hypothesis to research & debate: Natural forces have offset anthropogenic warming since 2000.